At Cliffview Resort you'll enjoy a traditional family vacation where our accommodations offer modern comforts with the legacy of vacationing from days gone-by. Choose from one room units that sleep four (4) or cabins that sleep six (6), eight (8), or ten (10). 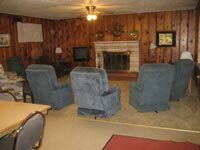 Each room or cabin is non-smoking and offers parking spaces and grassy areas for picnicking and pets. Our playgrounds, swimming pool, fishing barn and the lake are all within walking distance. Fully furnished kitchens in all cabins and select one room units. Call (254) 622.8897, we welcome any questions you may have and are happy to help you choose a room or cabin that will fit your needs. Full Kitchens in every unit below. Discount rate offered on 4 consecutive nights or more, excluding holiday weekends. Discount rate offered on any weekday stay excluding the Thanksgiving holidays. Discount rate also offered on weekend stays of 2 nights or more. The Hotel Occupancy Tax Rate is 9% of the cost of a room or cabin.